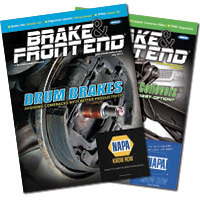 Tenneco’s Monroe Shocks and Struts brand –­ celebrating a century of service ­– is offering Visa Prepaid Card rewards to consumers who help enhance their vehicles’ steering, stopping and stability this fall by purchasing Monroe or Rancho products. 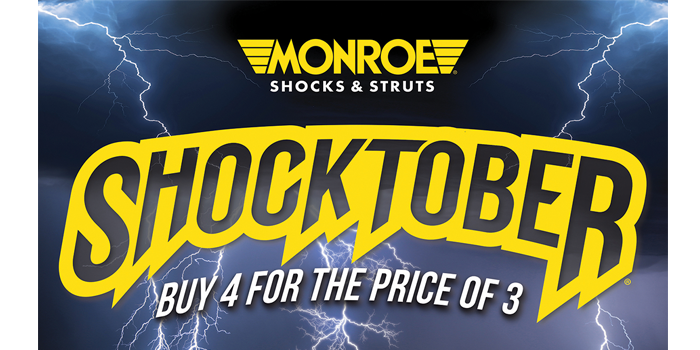 The Monroe “Shocktober” promotion enables consumers to get four qualifying Monroe or Rancho shocks or struts for the price of three on purchases made before Oct. 31. Consumers are eligible to earn a Visa Prepaid Card when they select qualifying combinations and quantities of the following products: Monroe OESpectrum, Sensa-Trac and Reflex shocks, struts and cartridges; Max-Air and Gas-Magnum shocks; Monroe Load Adjusting shocks; Monroe Quick-Strut replacement assemblies; and Rancho RS5000, RS5000X, RS7000MT and RS9000XL series shocks. Consumers who qualify for the rebate will receive by mail a Visa Prepaid Card equal to the lowest priced unit, up to the current suggested list price. Visit Monroe.com for program rules and restrictions. To begin the redemption process for the Shocktober promotion, download rebate submission forms at Monroe.com or ask for more information at participating automotive parts or service providers. All submissions must be mailed and postmarked by Nov. 30. Status of rebate submissions can be accessed online here.